Many service members looking to add strength are going about it from the wrong direction. 1. Posterior plan. 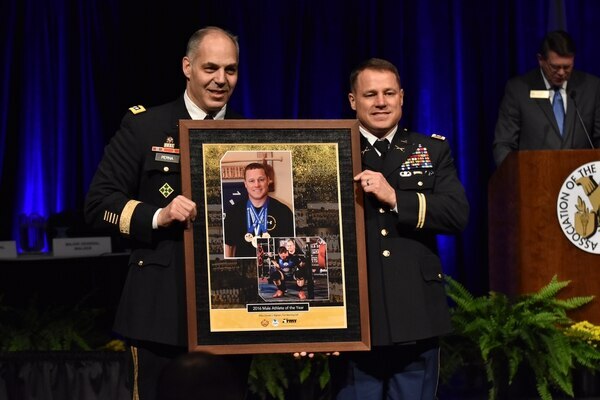 So, how would Bigham — the Army’s 2016 male athlete of the year after winning four gold medals at that year’s International Powerlifting Federation Raw Powerlifting Championship — recommend shaking up your workout? Instead, Bigham suggested a 180-degree rotation. Functional strength will come from exercises targeting the glutes, hamstrings and the rest of the posterior chain, he said. Biceps curls will help with what troops see in the mirror, but won’t help during ruck marches. Bigham weighs in around 180 pounds. 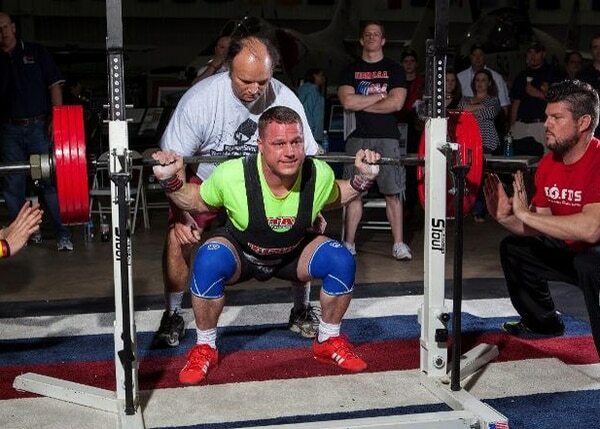 His in-competition squat tops 600 pounds. The 45-year-old has been a competitive lifter since 1991, when he was introduced to the sport as an enlisted Marine serving in Okinawa, Japan. 2. Power trio. Not surprisingly, the trio of powerlifters we spoke with advocated for the three lifts — squat, deadlift and bench press — that make up powerlifting competitions. But it’s not just out of loyalty or personal focus, said Army Staff Sgt. Brad Arbic, an intelligence analyst with 7th Special Forces Group whose 766-pound deadlift in a November event in Las Vegas set a record for his age and weight class. The three core lifts “really encapsulate all of the musculature,” said Arbic, 35, who weighs in around 300 pounds but can pass the Army’s tape test thanks in part to a 22-inch neck. They also direct focus away from areas that might not need it. 3. Go slow. Before the Marine Corps sent her to Okinawa as a military policeman, 20-year-old Lance Cpl. Mckenzie Curtis already had international travel experience as a member of the U.S. junior worlds powerlifting team that competed in Prague in 2015. She took second in her weight class, and though she gave up the sport (and lost 30 pounds or so) when she joined the Marines, she’s recently picked it back up. Her approach to adding muscle: Don’t take shortcuts, and don’t expect big leaps in performance. “Going up gradually each week may not seem like much, but in the long run you will see results,” said Curtis, who competes in the 84-kilogram (181-pound) class but said she may drop to 158 pounds as her lifting career continues. She builds power by adding five pounds per week to low-repetition, high-effort sessions on the core lifts: three sets, five reps each for squat and deadlift, five-by-five for bench. Too much to add? Go smaller if you must, but keep going. 4. Be flexible. Bigham isn’t big on single-joint exercises — they may help define a targeted muscle group, but they’re not reflective of the multi-muscle movements required of service members in the field. Already on the kettlebell bandwagon? Bigham suggests trying to keep the ball in space, rather than resting it on your wrist or forearm, for an additional stabilization workout. 5. Be versatile. The squat, deadlift and bench may provide a stellar core workout, but that doesn’t mean you can limit your fitness regimen to those exercises, or any other group of lifts. Curtis recently completed her first half-marathon and mixes in multiple visits to the StairMaster with her lifting routine. Arbic clocked a 15:50 on his most recent two-mile run. Bigham said a typical 20- to 25-hour training week should include four to eight hours of active recovery work, which could involve anything from stretching to a brisk walk. Smart lifting can build strength and help address lingering injuries; Arbic said the pain from an early-career back injury sustained during an airborne operation has dropped drastically thanks in part to his workout routine. And while he may not favor single-joint exercises for building overall strength, Bigham said they have great value for troops working through injuries. Targeting a weakened area gives the lifter a greater sense of what progress is being made, what parts of his form are being affected and, most importantly, a clear line on what’s causing any pain. Beyond injury, there are other reasons to put on the brakes. 7. Know your fuel. All three lifters stressed the importance of proteins when it comes to building muscle. Bigham recommended between 1.5 and 1.9 grams of protein for every kilogram of body weight — that might mean 175 grams or more of protein a day, so don’t count on a daily steak (60 or so grams for a 9-ounce meal) to check the box. Arbic leans toward tuna, while Curtis is a fan of protein bars. All three lifters stressed that dietary needs will vary widely based on the individual and the fitness goal; Arbic suggested learning as much as you can about your resting metabolic rate and other factors before you dive in on a new diet plan. 8. Stay still. Don’t be the lifter at the gym who is moving everything … except the bar. 9. Ask. Arbic’s build, and the number of plates he uses, can draw some questions from fellow lifters. He started a YouTube channel with videos that address some basic weightlifting techniques and concerns. Curtis suggested YouTube as a good starting point for those seeking weight-room tips or interested in breaking bad habits.